If they now know that life, civilization of man began in Africa. That Africa is the cradle of civilization, and from this dark continent of people the world became populated. Egypt is in Africa, so, why is it so inconceivable that the ancient Egyptian were African. No, I do not believe that the Egyptian of today are the original. They are committed to reducing us to a legacy of illiterate savages and slaves. But we know the truth. Is it known whether there’s a connection between the presence of ochre on mummies and the the colours used for skin colour in tomb murals? “Often the whole body was painted, with red ochre in the case of male mummies, yellow for females. 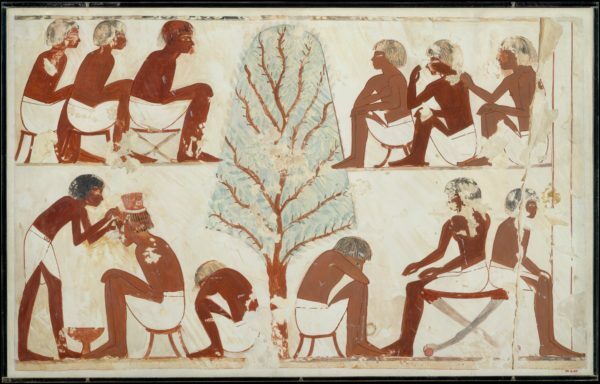 The same colouring convention was observed for the sexes in painted statues, coloured reliefs and wall-paintings until the mid-Eighteenth Dynasty. The idea behind it was that, even if he were the highest official in the land, it was the man of the house who went out in the sun and got a tanned skin. On the other hand, no highly-born woman would allow herself to be seen except with a pale skin; if she had to go out into strong sunshine she was suitably covered or carried a shade. The only women with sun-tanned skins would be those who belonged to the lowest social class, such as field workers” (pp29-30). Do we know whether ochre has been found with Kushite burials? 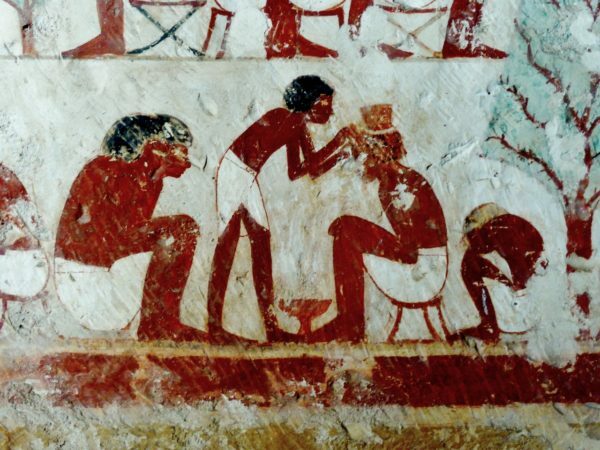 The tomb of Userhat is one of my favorites from the 18th dynasty period; and you are right, the images from the hundreds of New Kingdom tombs period shows countless (thousands possibly) of dark-skinned, rank-and-file Kemites as a matter of course, and should be their standard depiction in the public sphere. Also, you’ve mentioned the oft overlooked fact of the Arab invasion (the Persian, Greek, Roman, Hyksos, Asiatic among others), which many miracolously infer a continuity between the ancient and modern! That would be akin to saying that modern day Americans were the Incas, Aztecs, Olmecs, without any significant turnover in population. A potential complication for this argument is that, in most Egyptian art from the Old to Middle Kingdom, female subjects are distinguished from their male counterparts by having yellow-ochre skin. In the New Kingdom, one does find exceptions to this rule which portray Egyptian women as deep brown-skinned like the men, and apparently both men and women are usually painted brown in earlier, predynastic art. But how would one account for the representation of men and women as having such distinct skin tones during the Old and Middle Kingdoms if all Egyptian portrayals of themselves are to be taken at face value? There is a clear distinction between the use of colour for symbolism and the depiction of people in everyday scenes. This explains why there are discrepancies. I understand tomb paintings are supposed to have a religious function (by depicting an idealized afterlife), so I don’t see why everyday scenes in this context couldn’t have possessed symbolism as well. That said, it’s my belief that those New Kingdom paintings where both sexes are portrayed with deep brown skin reflect the reality most. 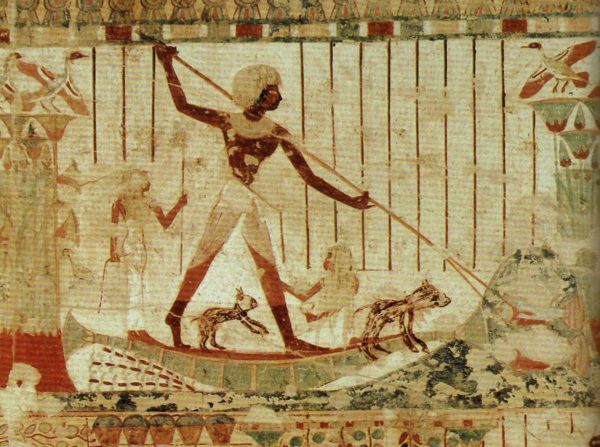 The fact that Egyptians typically portrayed Middle Eastern “Asiatics” and Mediterranean Libyans as paler than themselves might also be telling.